You know something is brewing when an online wireless phone retailer begins to announce pre-orders for an upcoming Android powered tablet – which could literally hint to a very close launch. We haven’t heard too many things regarding the G-Slate from T-Mobile, but that’s not stopping LetsTalk from opening up pre-orders for the tablet starting tomorrow. Yeah, you heard that right! You can essentially guarantee yourself the 3D photo/video taking capable tablet with a pre-order with LetsTalk, but more importantly, their announcement could possibly hint to a relatively close launch in the near future. 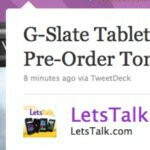 The rumors have previously pinpointed to April 20th as being the launch date for both the T-Mobile G2x and the G-Slate tablet – so the news about LetsTalk offering pre-orders for the tablet could provide some credibility to that speculated April 20th release date.